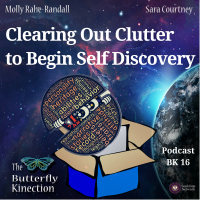 Molly talks about beginning to walk down the path to discovering ourselves, living our truest most connected selves, and not getting caught up in daily life in such a way that we forget who we truly are. Clearing out the clutter to begin self discovery isn’t just about letting go of materialistic items. It is about redefining what is important in our lives and in our relationships. If we are not taking care of ourselves first, then we cannot really be present for those around us. When we put ourselves first, we can begin to speak up for ourselves and set boundaries in a loving way. There will no longer be room for people who are choosing to put other people down and who are choosing to stay miserable. We cannot truly discover who we are, who we want to be, and where we want to go in life until we move away from the people who are holding us back. We cannot truly start to discover self until we allow ourselves to open up to the possibilities of who we are and who we can be, and nurture our mind, body, spirit and soul. By putting out to the universe that respect and love is a requirement and not an option, we can move away from the people holding us back.